With almost 90 years of experience in woodwork, Delta Power is among the most respected brands in woodworking tools. The company focuses on innovations that help the woodworker to create respectable works of art quickly, and with more precision. 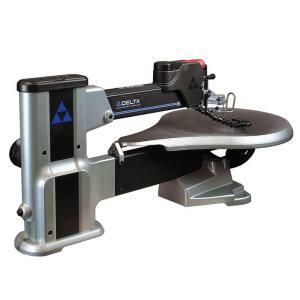 The delta scroll saw arrived on the market in 2014 and it is under the Delta’s five-year warranty. This saw will help you perform tasks that used to take you 8 hours, in 6 hours. The saw not only has a blade tensioning mechanism that is easier to control, but also blades that can easily be put in and out. The Delta 40-694 Scroll Saw review below will help you understand your expectations when buying this product. It gives the user the opportunity to select stroke speeds of between 400 to 1750spm. This allows for accurate and smooth cutting of soft as well as hard materials. The speed adjust does not work well for some customers. What is the difference between the Delta 40-694 and the DeWalt DW788?The two scroll saws are somehow similar! The one feature that separates the Delta 40-60 from the DeWalt DW788 is that its upper arm clasps into position when being raised for blade change. You will not struggle with propping it up with some piece of wood or using your hand to hold it up. What Comes with the Delta Scroll Saw? The Delta 40-694 is a compact saw that comes with changeable speed adjustments that can be tailor-made to fit your needs. The set includes a saw, stand, and a dust blower and work lights. You will also get an oversized and flexible table that measures 16”x24″. The table turns both right and left. What are the standard-setting Specs of the Delta Scroll Saw? As expected of a saw that has been created with the professional woodworking markets in mind, the Delta scroll saw has some unique standard-setting specs. Its 1.3 amp motor can hack speeds of up to 1,750 strokes a minute. Also, the delta 40-694 has a cutting capacity of 20-inches as well as a ¾ inch stroke range. What is the cutting capacity of the Delta Scroll Saw? With a 16-inch assembled width and 39-inch assembled depth, the delta 40-694 is a compact saw which is heavy enough to take on the most rigorous sawing tasks. Also, the unit has a cutting scope of 2 1/8 inches and 1 5/8 inches at 90 degrees and 45 degrees respectively. What do customers say about the Delta Scroll Saw? The delta scroll saw is an excellent investment for individuals looking to explore a beginner model. It is easy to operate and flexible in regards to movement. It has easy blade changes, no vibration and is smooth running.